SWCC Style “F” movement next to the much larger Style “E” movement. Click on the picture to enlarge. 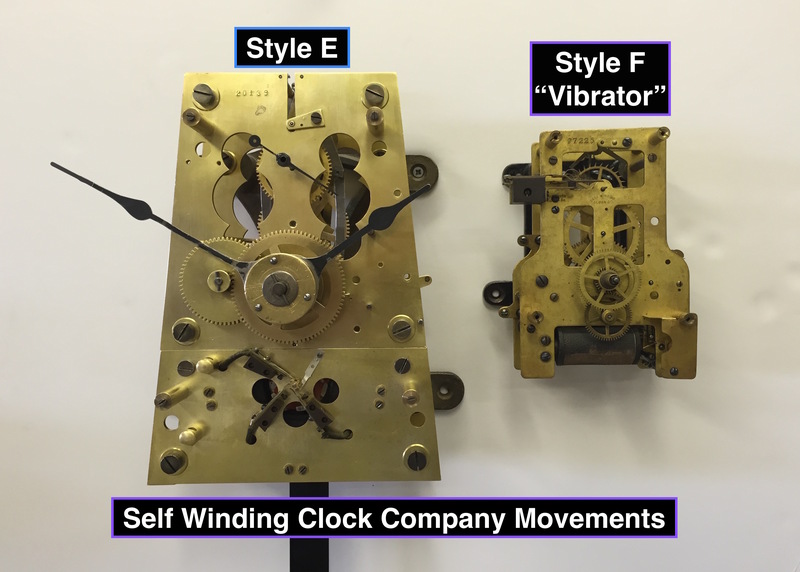 The Self Winding Clock company was formed in 1886 and marketed an innovative electro-mechanical clock mechanism. The movement incorporated a small electric motor that rewound the mainspring each hour. The vast majority of SWCC clocks have Style “F” movements. They were produced in 60,80,120 and 140 beat versions. These movements appeared in 1898 and are wound hourly by a vibrating armature. The earliest SWCC movements were wound each hour with a rotary motor that was patented in 1884 by Chester Pond, one of the company founders. In addition to the conventional Style “A”, “C”, and “F” movements the SWCC made a few much larger movements which they designated the Style “E” movement. This movement operated hands for dials up to 50 inches. All styles of SWCC movements have Graham dead beat escapements. The pictured Style “E” movement is a rare exception for it has a Gerry Gravity Escapement. The Gerry Gravity escapement was patented by James Gerry in 1883. Gerry worked for the E. Howard clock company and later became the Supervisor of the SWCC. The Gerry Gravity escapement is unique for it employs 4 gravity arms rather two gravity arms to operate the escapement. The operating movement can be seen on Youtube by clicking on this link. The gauge may be used to measure the strength of a cell in a battery used for electric clock systems during the period the first electric clocks were introduced in the United States. 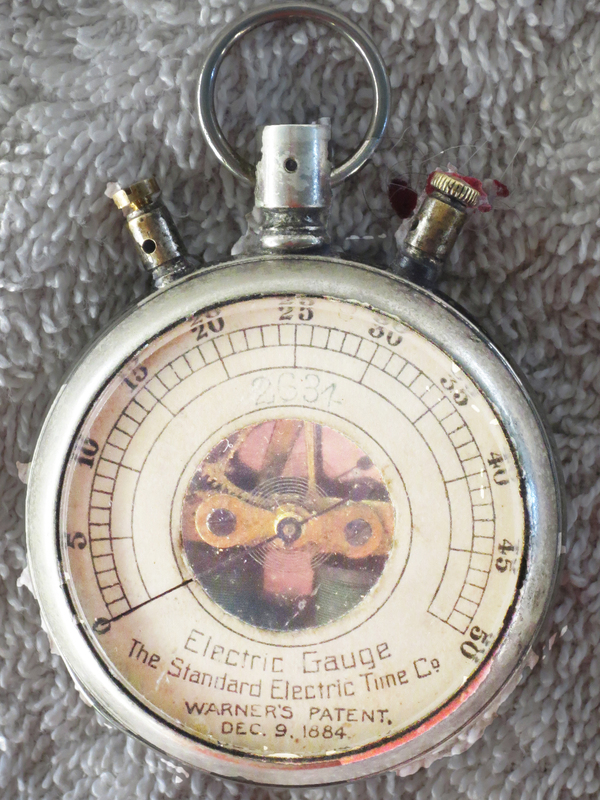 Without dismantling the pocket watch size meter with the snap-back removed, two small series connected electromagnets can be seen. The pole pieces are arranged to form a flux gap. A curved armature pivoted on the the axis of a toothed segment is attracted to the flux gap when the electromagnets are energized. A spiral hair-spring opposes the rotation of the toothed segment carrying the armature . The toothed segment engages a pinion mounted on the axis of the pointer. Experiment with a single flashlight cell causes the needle pointer to rotate clockwise about forty-five degrees pointing to the middle of the scale. I believe the gauge likely has a full scale reading of less than three volts based on the logic of the electrical potential of the LeClanche (zinc-carbon) cells or the lead-acid cells commonly making up telephone and clock system batteries of the pre-900 industrial period. Note the serial number, 2634 on the face and compare with number 22 in the advertisement. 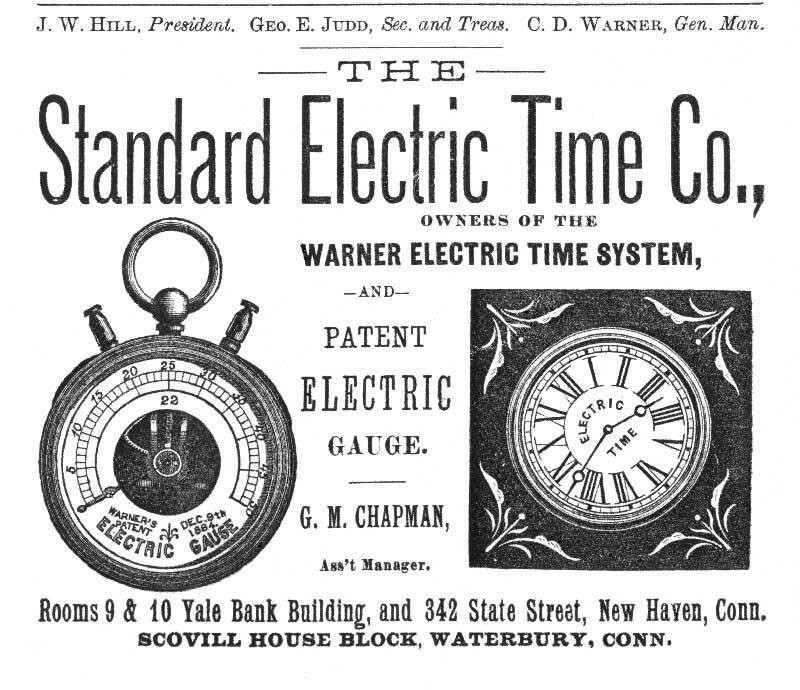 This would suggest that Warner’s Electric Gauge was a widely used service tool in primary battery systems. The gauge was listed on eBay. I bid and lost. Several days later, while visiting Dave O’Dell, I noticed the gauge on his workbench. The identity of winning auction bidder J3442’s was revealed. Thanks Dave. 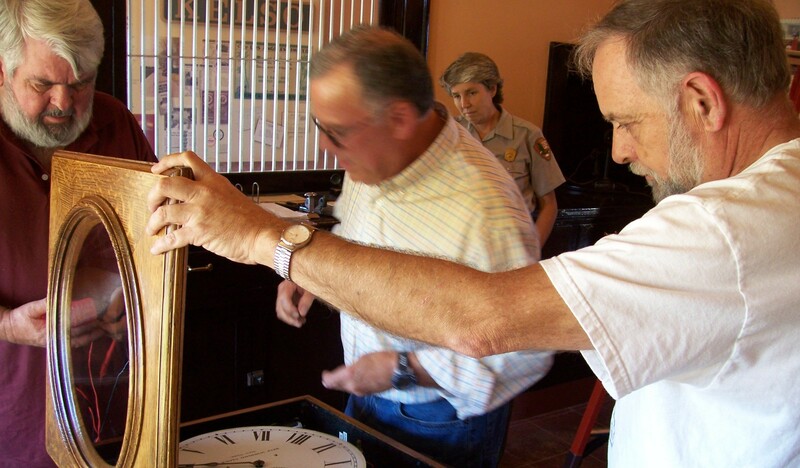 In 2007, Chapter 133 took on a project to restore and install two Self Winding clocks in the restored Union Pacific station at Kelso, California which had been repurposed in 2005 as the Visitors Center for the Mojave National Preserve. We made contact with the Linda Slater, who was the ranger in charge of preservation and found out that Union Pacific had donated a clock for use in the depot but it was in need of repairs and replacement of parts needed for the synchronization function. This clock would fit nicely in the restored visitor’s lobby but we also felt a clock should be present in the ticket office too. We put together a plan, got the go ahead from the National Preserve, and began to move forward. Alan Bloore, Don Stocker, Tom Faragher, and I made a trip to the Preserve HQ in May of 2007 to view the donated clock and after lunch at the Mad Greek in Baker drove to the Visitor Center to view the proposed clock locations. We agreed that the ticket office needed a clock too and Alan Bloore had one that he agreed to donate to the project. 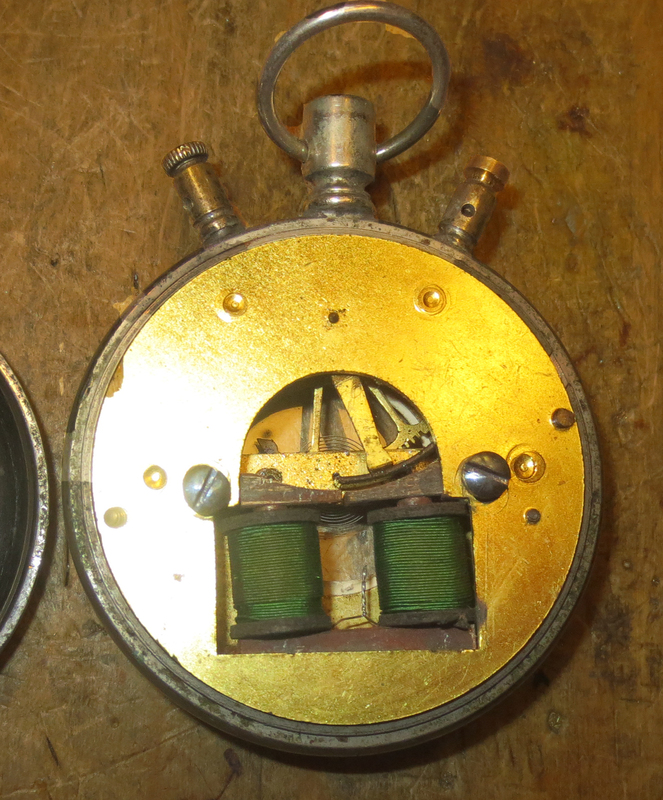 Tom Faragher fabricated the missing parts and the two clocks were rewired and tested by Alan. Finally, the clocks were working and we made a trip to Kelso on November 7, 2007 for the installation. Linda Slater met us and helped with the logistics. A write up was made in the Preserve newsletter giving us credit for our help. The clocks are still keeping good time almost seven years later. On May 30 of this year I visited Kelso and did a tuneup to adjust the rate and improve the beat which was off a bit with the office clock. The personnel at Kelso find the clocks both useful and interesting and make the battery changes and tweak the rate as needed.